A stunning Fiesta 1.4 Zetec 3dr with just one owner from new and boasting a full Ford main dealer service history. This low mileage Fiesta is sold with a brand new MOT and nationwide parts and labour warranty. HPI checked and clear, drives perfectly. Features alloy wheels, chrome detailing, front fog lights, remote central locking, air conditioning, SONY DAB radio, Bluetooth connectivity, an Mp3 CD player with aux. and USB inputs, ISOFIX child seat fixings, trip computer, cup holders, electric windows/mirrors and much more. Drives superbly and is HPI checked and clear. Please call 0117 290 1234 or book your test drive online. Part exchange and finance options available, subject to approval. 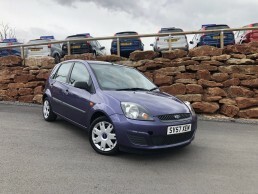 A one owner, low mileage Ford Fiesta Zetec 3-door hatchback with a full main dealer history. Part exchange and finance options available, subject to approval.